We provide a range of articles about Christmas, from the reasons we celebrate the birth of Jesus, to how to make cards to send to our friends and relatives. Christmas as celebrated today is a culmination of centuries of traditions that are religious and secular and which came from different countries around the world. It is interesting therefore to look at some of the general ways in which Christmas is celebrated in these countries. The traditions examined for each country will be examples of some of the things that are unique to that country and which are done today, or which were once done by people in those countries. To begin, it is symbolic to look at the town of Bethlehem, which is believed to be the birthplace of Jesus. The Church of the Nativity is located in Bethlehem and at Christmas it is decorated with a lot of flags and other Christmas decorations. A very large crowd usually gathers at The Church of the Nativity on Christmas Eve to see a dramatic parade procession of horsemen, led by police who are mounted on Arabian horses. Following the police in the procession is a lone horseman who carries a cross, followed by churchmen and government officials. Members of the procession solemnly enter the doors of The Church of the Nativity and place an ancient effigy of Jesus in the church. A silver star located deep in an underground cave-like section of the church marks the site where Jesus was born. A star is also set atop a pole in the town's square. 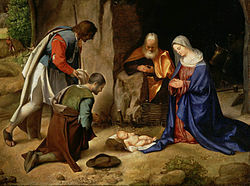 In Bethlehem, homes of Christians usually have a cross over the door and a manger scene is usually set up inside the house. In Germany, home of the Christmas tree tradition, the Christmas tree is not seen until Christmas Eve. The tree is usually kept in a special room, or elsewhere, and decorated in secret with lights, ornaments, tinsels, angels, candies, nuts and cookies. It is then lighted, the presents placed underneath and then shown to the delight of Children on Christmas Eve. In Germany, Dec. 6 is known as St. Nicholas Day when Santa visits the homes of boys and girls. On the day before, Dec. 5, children leave a shoe or boot outside or by the fireplace for Santa Claus. If they were good, he places gifts and candies inside the shoe. But if they were naughty, children will find twigs or a rod in their shoe. Dinner on Christmas Day includes roast goose, long loaves of bread filled with raisins, nuts and dried fruits. Other sweet delicacies are also enjoyed. Many traditions in England are similar to those in the United States because such traditions originated in England and were brought to the United States by immigrants. The tradition of sending Christmas greeting cards started in England and is still popular at Christmas, as well as the tradition of neighborhood caroling on Christmas Eve. Children also hang stockings on Christmas Eve in anticipation of Santa Claus filling them with Christmas gifts or treats. The holly, ivy and mistletoe are also used a lot in Christmas decorations. In England, the traditional Christmas Dinner is roast turkey, goose or chicken with stuffing, vegetables and roast potatoes. Dessert consists of the British or Christmas pudding with brandy sauce. A rich, fruit-filled Christmas cake may also be enjoyed later in the day. A tradition of pulling Christmas crackers also goes with the serving of food on Christmas Day. A cracker is a paper tube that contains a party hat, riddle, toy or trinket, and is brightly colored and twisted at both ends. It gives out a crack as the contents pop out when it is pulled at each end. Also on Christmas afternoon, the Queen broadcasts a Christmas message to the nation, which is heard on radio and television. The day after Christmas is also a holiday that is known as Boxing Day. My two daughters (aged six and three) were thrilled to receive their letters from Santa. The older one took hers to school - and I think it caused much jealousy! I think it's a great idea as we can help your charity while having a lot of excitement ourselves.